Shiner coach Brandon Siegel waves runner Amber Shimek around third Saturday during the Class 1A state softball championship game. AUSTIN -- Shiner coach Brandon Siegel didn’t really need to give his Lady Comanches any motivational speech before Saturday morning’s Class 1A state championship game against the Bosqueville Lady Bulldogs. As a matter of fact, pep talks weren’t required much at all the entire softball season in Shiner. Motivated by the heartache of their 4-1 loss to Bosqueville in last year’s final, the Lady Comanches gained revenge and much more in their 11-1, six-inning rout of the Lady Bulldogs at McCombs Field. "Revenge was the motivation for all of our players and myself," Siegel said as he held the championship trophy. "We didn’t want what happened last year to happen again." Bosqueville (25-8) beat Shiner 4-1 in last season’s final when Raygan Feight hit a sixth-inning grand slam off pitcher Heather Haas. This time, Haas and the Lady Comanches’ offense never gave the Lady Bulldogs a chance for a dramatic comeback. Haas scattered eight hits and struck out only three. But Shiner’s bats erupted for 13 hits, including five in a decisive, six-run third inning. The Lady Comanches, who finished the year with a 24-6 record, enjoyed an eight-run inning in Thursday’s 11-1 semifinal win over Maud. Haas, who was named the Class 1A tournament MVP, watched video of last year’s state final loss with teammates for much of the season, including Friday night. "It was hard to watch it," Haas said. "A few of us would start crying sometimes. But we learned from it. It pumped us up." Shiner broke open a 1-1 game in the third inning by putting together four straight hits and sending 10 players to the plate. Lauren Michalec, who was 2-for-4 with two RBIs and a run scored, hit a one-out, infield single to get the big inning started. Taylor Hajek followed with a single and Haas, who went 2-for-4 with an RBI and three runs scored, drove in Michalec with a single to make it 2-1. Amber Shimek, who was 2-for-4 with two RBIs, then followed with a two-run double to the left-field wall. After Paige Michalec’s RBI single made it 5-1, Bosqueville appeared to end the inning when Ieisha Flowers struck out swinging. But catcher Grace Getman failed to handle the pitch and Flowers raced to first base safely. Shiner capitalized on the miscue as Holly Haas, Heather’s sister, added a two-run single to pad the Lady Comanches’ lead to 7-1. 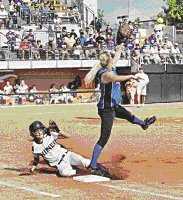 "I knew they had the potential to put up a big inning and, with Heather, I knew they weren’t going to give up a lot of runs," Bosqueville coach Clint Zander said. Heather Haas went back to the mound with the six-run lead determined not to allow herself or her team to get too comfortable. "That ran through my mind," she said. "I knew that anything could happen. I knew they were capable of having a big inning like we did." But the Lady Bulldogs never mounted a serious comeback. Holly Haas’ RBI single and Lauren Michalec’s two-run base hit highlighted Shiner’s three-run fourth inning that widened the Lady Comanches’ lead to 10-1. In the sixth, Heather Haas reached on a throwing error by shortstop Haley Feight, advanced to second base on a wild pitch, and moved to third on Shimek’s flyout to center field. Heather Haas, who walked off McCombs Field last season without a gold medal for the second straight year, raced home with the game-ending run on Morgan Ullman’s fielder’s choice grounder to second baseman Caitlin Jackson. "I would have never imagined that we would run-rule them," Siegel said. "That just shows you the drive of this team. They just weren’t going to leave here this year without getting the job done." Shiner sent an early message to Bosqueville in the first inning. Getman led off the game with a single and was sacrificed to second base. With two outs, Haley Feight hit a sharp single to center field. Flowers scooped up the ball and threw it home to catcher Holly Haas to retire Getman trying to score. "I knew she was going," Flowers said of the play. "I knew I just had to gun the ball to Holly." "I think that play set the tone for the rest of the game," Paige Michalec said. "That gave us a lot of momentum." Ullmann’s RBI single gave Shiner a 1-0 lead in the second inning, but Bosqueville came back to tie the game in the third on Michelle Miller’s run-scoring single. But all the Lady Bulldogs did was motivate Shiner even more. "The girls were just so focused on their goal," Siegel said after Shiner won the third state softball title in school history. "They did what they had to do to win. Seeing them do that is just a wonderful feeling." Ashley Barnes and Grace Getman. Heather Haas and Holly Haas. W: Haas (24-5). L: Barnes (12-7). Highlights: (B) Getman 2-for-3; Michelle Miller 1-for-3, RBI. Ieisha Flowers 2-for-3, 2 runs; Holly Haas 2-for-3, 3 RBIs. Records: Bosqueville 25-8, Shiner 24-6. Note: Shiner wins Class 1A State Championship. Coy Slavik is the sports editor for The Victoria Advocate. Contact him at 361-574-1206, or by e-mail at cslavik@vicad.com.